Subscription to The Photo Review quarterly journal (mailed to your department office) and the newsletter (sent as a PDF by email 8 times a year to as many faculty and students specified). Please only use this option if you are subscribing on behalf of a school or art department. 1. 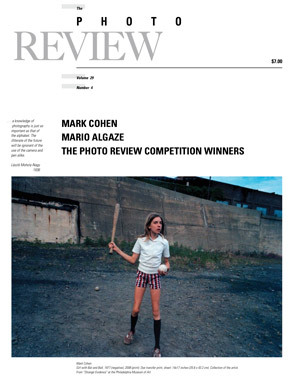 A departmental subscription to The Photo Review, $45. 2. With your regular subscription, we will send The Photo Review Newsletter directly to as many faculty members and/or students as you want for just $5 more each. Just send their names and email addresses. One copy of the journal will still be sent to the department office. 3. With your extended regular subscription at $100, we will send The Photo Review Newsletter directly to up to 25 more faculty members and/or students as you want. Just send their names and email addresses. One copy of the journal will still be sent to the department office. 4. With your extended regular subscription at $125, we will send The Photo Review Newsletter directly to up to 50 more faculty members and/or students as you want (and $150 for up to 75 more, etc.). (This is a particularly good option for large departments.) Just send their names and email addresses. One copy of the journal will still be sent to the department office. You can send the names and email addresses of additional students and faculty to receive newsletters to info@photoreview.org.